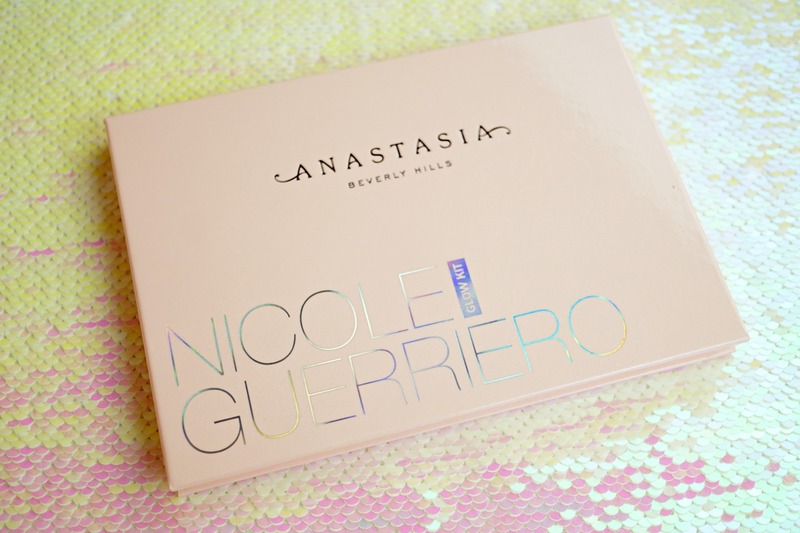 If you are as avid YouTube watcher as I am, you probably know that one of the coolest makeup brands, Anastasia Beverly Hills, and a top YouTuber Nicole Guerriero just came out with a collaboration highlighter palette. The palette launched for a quick second at the Sephora App (that’s how I scored mine) and now it’s available at the brand’s website and at Sephora website. While there is a controversy about this launch on YouTube where some people claim that their palettes arrived damaged, mine arrived in mint condition—and as beautiful as it could possibly be. Okay, I’m done with the spoliers—let’s get into this Glow Kit review. The palette comes in a perfect shade of pink that immediately sold me on it, but there is more into it. In addition to the palette itself, the package features a sleeve so the palette stays close when you travel (as it doesn’t have a magnetic closure). The highlighter pans are generous in size which probably explains why there is no mirror featured. 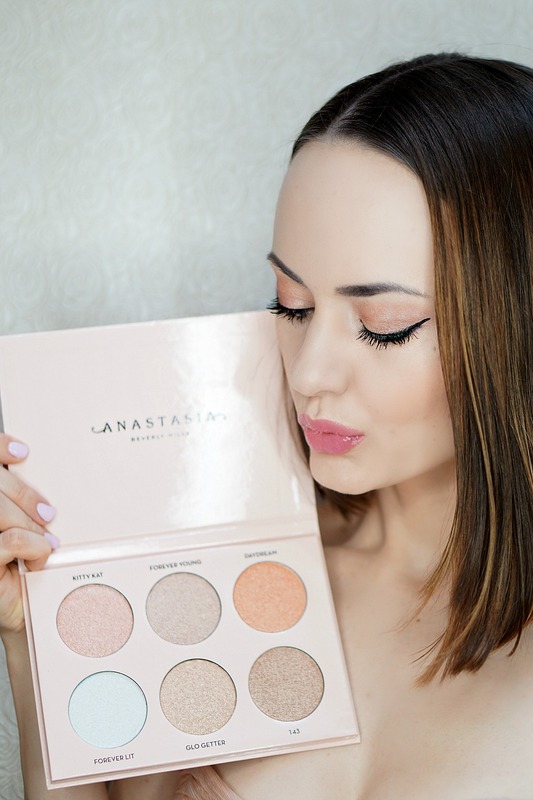 Overall, I really like the packaging and believe it’s a beautiful palette to look at or display in your beauty room. 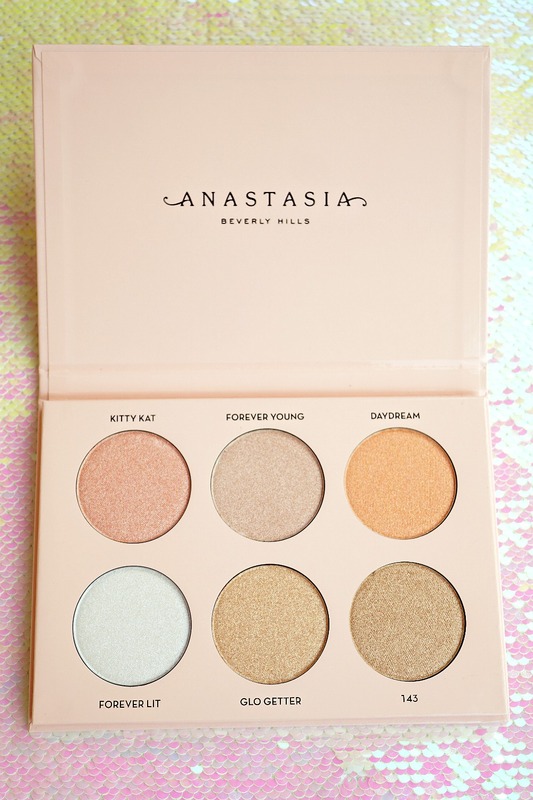 There are 6 highlighters in this limited edition palette, 4.5 g / 0.16 oz. each (total of 27 g / 0.96 oz.). The palette goes for $40 which means that you pay $6.67 per each highlighter or $1.28 per gram of a product. The brand calls the formula of those highlighters “metallic-luster” which means that these provide a bit more subtle glow compared to a typical metallic highlighter while still featuring almost undetectable pieces of glitter. These are powder highlighters that deliver an intense, luminous finish. According to ABH, these highlighters could be applied wet or dry. This palette is vegan and cruelty-free which is so amazing! While some reviewers suggested that these highlighters are “too extra,” I found them very wearable—even for my pale skin tone. I enjoyed how long the highlighters stayed on my skin. While I would not call them “heavy duty” ones as these do fade throughout the day, the longevity of those products is pretty impressive. These highlighters were super easy to apply and blend. As you see in photos, I used a fan highlighter brush and I didn’t feel the need to go over with a more dense brush to properly blend the product. 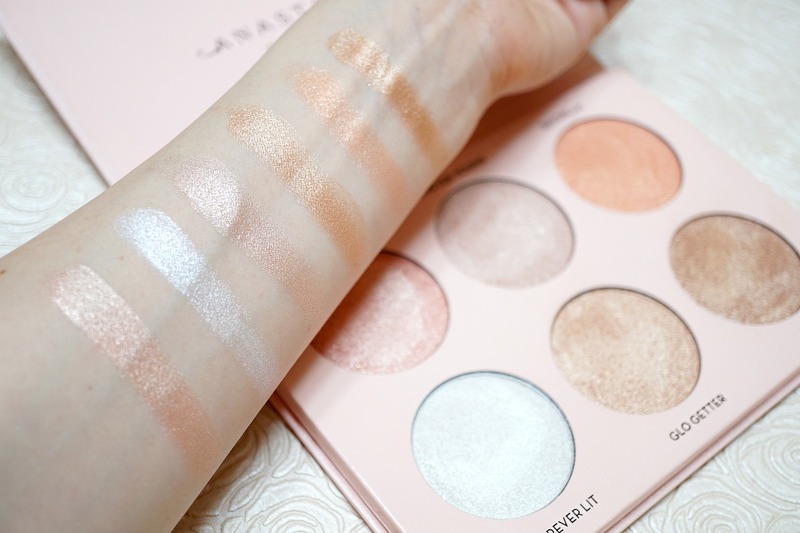 In other words, the highlighters from the ABH x Nicole Guerriero palette are very blendable and are easy to work with even if you are just starting using makeup. The palette features 6 metallic highlighter shades that could be used not only on your face but also as eyeshadows. I didn’t expect it to be, but this shade was pretty blinding for a pink shade highlighter. This highlighter immediately illuminated my complexion and made my skin look not only glowy but also…healthier! This shade felt a bit more glittery than the Kitty Kat and it provided a strong silver finish. While it didn’t really work in combination with my warm-toned makeup of the day, it proved to look beautiful on the days when I picked colder shades for my eye and face makeup. I would describe this shade as peachy with beige undertone. It’s a very subtle shade that is so wearable, especially for those days when I’m using my Too Faced Sweet Peach palette—I actually think that this shade of a highlighter works perfectly with any eyeshadow look that you create using the Sweet Peach Palette. In my opinion, this is the most smooth shade from the palette and I really love how it applies. While it looked very similar to the 143 shade from the palette, I felt that this shade was still worth including into the kit. Especially because it’s my absolute favorite shade to apply as a wet eyeshadow. As per description, it supposed to be a bold coral shade, but similar to other shades from the palette it turned out to look less pigmented on skin than the swatch. I would compare this shade to my favorite blush by Pixi Beauty as it’s not only a great highlighter but also a decent blush topper. Meaning, you can apply it on top of the matte blush to make it look more shimmery. This shade looked almost too bronzy when I swatched it, but it was not as pigmented while applied on my skin so I would call it a pretty wearable shade. I expected it to be too dark for my skin and was planning on using it primarily as an eyeshadow, but when applied on the skin it actually performed okay. It took a bit longer to blend it than the rest of the shades in the collection, but it did look great on the skin. Call me extravagant, but I am totally up to wearing each and every shade from this palette even if it seems to be too dark for my fair complexion. Granted, I don’t love all of the shades equally, but I would still find the way to incorporate them into my routine—if not as a highlighter then as an eyeshadow. Saying so, the lightest shade from this palette is Forever Lit and it looks great if you have super pale skin. 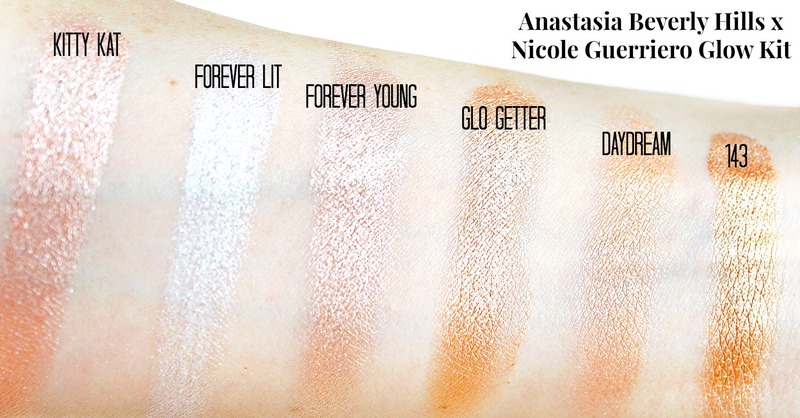 Kitty Kat and Forever Young will help to add a healthy glow to your skin without looking too pigmented while the rest of the shades will probably more suitable to use as eyeshadows—if you are not comfortable with pigmented highlighters and prefer more subtle finish. * If used as a dry powder highlighter, the brand recommends applying it with the ABH brush #23. It’s a large natural bristles brush that many people recommends as it’s extremely soft (I can’t confirm that as I don’t have that particular brush in my collection). * If used as a wet highlighter or an eyeshadow, I would recommend spritzing the brush with a setting spray (I prefer MAC Prep + Prime) before picking a product so it sticks to your skin and thus wears longer. As of now, the palette is available at Sephora and at Anastasia Beverly Hills website. 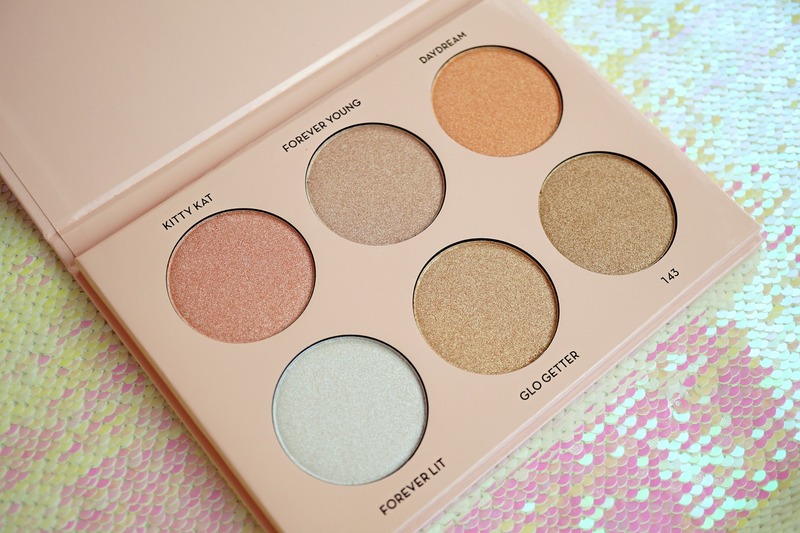 Please keep in mind that it’s a limited edition palette so if you really want to have it in your collection, I would purchase it ASAP before it’s sold out. Overall, I’m really loving this palette and believe it’s a great multi-purpose product to have in your collection. While I do have a bunch of different highlighting palettes on hand, I did reach out to this one very consistently. I loved playing with this beautifully designed set and enjoyed the fact that all of those shades are so blinding and blendable. I do recommend picking up this palette and it’s definitely a “hot” for me.